The strength of our restaurant is also the possibility to welcome guests in a comfortable, air-conditioned environment, ideal also for those looking for a solution for a business lunch in Florence in a friendly and familiar environment. In via Palazzuolo, the road running from piazza Ottaviani (via de’Fossi) to via del Prato, stands the Church of San Francesco dei Vanchetoni. In the past, anyone changing to pass by the church at around five o’clock on the last Sunday of Carnival (the last Sunday before Lent) would have seen crowd of people thronging in front of the door hoping to catch a glimpse of what was happening inside. As well the dignitaries, there were many noblemen and eminent professionals and even a good number of foreigners, all holding their invitations in plain sight, since entry was restricted to a given number of guests. The curiosity of the crowd was entirely justified, for inside the church a most unusual event was taking place, a moving and a poetic ceremony in surroundings of the greatest artistic value. From the door opening onto the church the high altar at the end cou|d be seen, brightly lit and sei with beautifully engraved embossed silver trays. Then there was the dais where the dignitaries sat, including his Grace the Archbishop, he too wearing the symbolic white apron for the occasion. The guests sat along the side walls the church in the wooden stalls beautifully carved by Giambattista Paolesi and in front of them, lower down, the hundred poor folk who had been invited sat before laden tables. There were five tables on each side of the church, at each of which sat ten of the local poor over the age of fifty, all dressed identically in black cloaks with white bands around their necks, awaiting the lavish banquet with solemn joyfulness. When everything was ready, the procession would begin followed bu a special ceremony during which the food was distribuited. 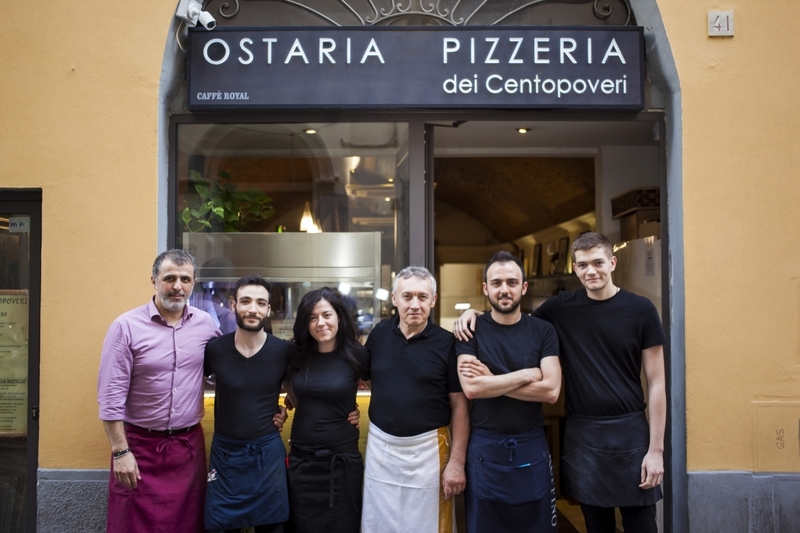 The Ostaria dei Centopoveri, which opened on the 5th December 1992, is named after this fascinating ancient tradition of the supper for the hundred paupers.